DFM-135H Full hydraulic anchor drilling rig is widely used in the construct requirements of subway, high-rise building, airport and the other deep foundation pit. jet-grouting, which can be apply for general jet-grouting and enlarged anchor construction. 1. Equipped with appropriative casing-followed drill tools (such as drilling rod, casing pipe, eccentric bit, etc). In unstable stratum, it can use casing rods to do wall protecting drilling, and equipped with suitable drilling bits to finish the hole drilling. It is with high efficiency and excellent quality. 2. 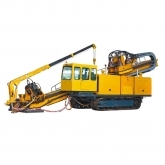 This drilling rig is suitable for deep foundation pit. By changing to jet grouting module, it can implement jet grouting construction. This drilling rig is also suitable for construction in geothermal borehole, precipitation well, mini steel-pipe pile, and mini sets-in-pipe pile. 3. Except for crawler chassis, turn plate, clamping and breaking device, we also supply other spare parts for clients to choose. Users can choose relative accessories suitable for your construction when you purchase our drilling rigs. 4. Radiator system: According to local special construction condition, optimize its radiator system, which guarantees the hydraulic system would keep its temperature in 45℃, and always below 70℃ when in outside.